The Past unreal conditional is used to talk about imaginary situations in the past. 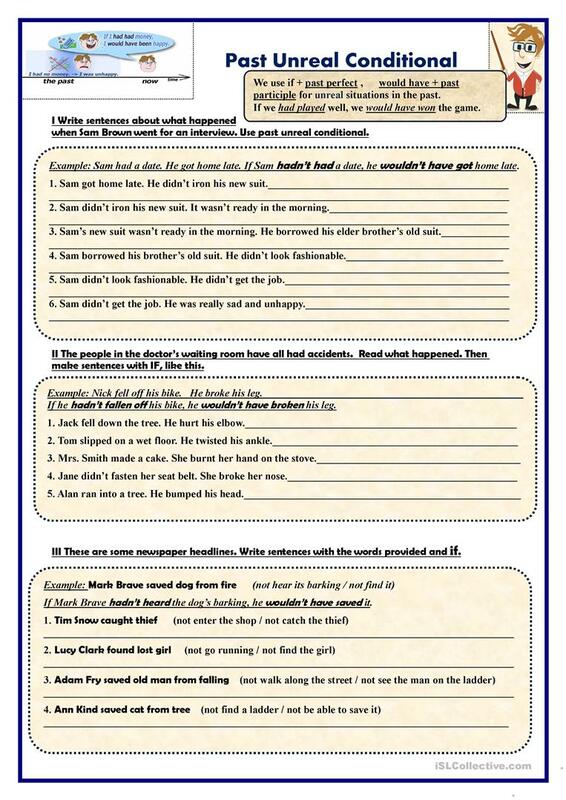 This worksheet consists of three different exercises. Hope you find it useful . This downloadable teaching material is recommended for business/professional students, high school students and adults at Intermediate (B1), Upper-intermediate (B2), Advanced (C1) and Proficient (C2) level. It is aimed at revising Conditional 3 (third conditional) and Conditionals in English, and is useful for strengthening your class' Spelling, Speaking, Reading and Writing skills. tantana is from/lives in Russia and has been a member of iSLCollective since 2012-11-28 17:09:54. tantana last logged in on 2019-04-24 08:27:47, and has shared 260 resources on iSLCollective so far.